NASA's Stardust spacecraft encountered Comet Wild 2 two years ago, gathering samples of cometary dust for return to Earth. In this Dec. 21 news conference, mission officials and scientists detail the probe's homecoming and planned landing in Utah scheduled for January 15, 2006. The first robotic space mission to visit the distant planet Pluto and frozen objects in the Kuiper Belt is explained by the project's managers and scientists in this NASA news conference from the agency's Washington headquarters on Dec. 19. Bill Gerstenmaier, NASA associate administrator for space operations, discusses the latest space shuttle program news, including the decision to remove the PAL foam ramp from future external fuel tanks, during this December 15 teleconference with reporters. The Gemini 6 mission launched from the Cape at 8:37 a.m. December 15, 1965 to rendezvous with the orbiting Gemini 7 spacecraft. The rendezvous occurred and Gemini 6 safely returned to Earth. NASA's Cassini spacecraft orbiting Saturn is wrapping up a phenomenally successful year of observing the mysterious icy moons, including Enceladus, Dione, Rhea, Hyperion and Iapetus. Mission Control remembers the spacewalking efforts by astronaut Jerry Ross and Jim Newman from this week in 1998. The duo worked to connect the first two pieces of the International Space Station -- the Russian-made Zarya control module and the U.S Unity node. To the surprise of astronomers, NASA's Hubble Space Telescope has photographed a pair of new rings around the distant planet Uranus. The largest is twice the diameter of the planet's previously known rings. 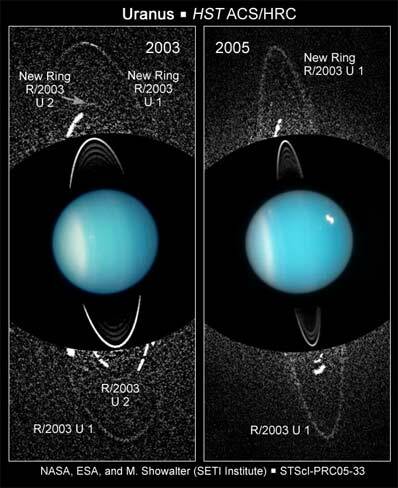 The new rings are so far away that they are being called Uranus' "second ring system." In addition, Hubble has spied two small satellites, one sharing its orbit with one of the newly discovered rings. Even more surprisingly, precise analysis of the data reveals that the orbits of Uranus' family of inner moons have changed significantly in the last decade. Collectively, these new discoveries mean that Uranus has a densely packed, rapidly changing, and possibly unstable dynamical system of orbiting bodies. "The new discoveries dramatically demonstrate that Uranus has a youthful and dynamic system of rings and moons," says Mark Showalter of the SETI Institute. "Until now nobody had a clue the rings were there, we had no right to expect them." Since dust in such an orbit is expected to be depleted by spiraling away, the rings must be continually replenished with fresh material. Showalter and collaborator Jack Lissauer of the NASA Ames Research Center propose that the outermost ring is replenished by a 12-mile-wide companion satellite, named Mab, which they first saw in 2003 using Hubble. Meteoroid impacts continually blast dust off the surface of Mab, and the dust then spreads out into a ring around Uranus. (Other small moons are linked to rings, including Amalthea at Jupiter, Pan at Saturn, and Galatea at Neptune.) Mab's ring receives a fresh infusion of dust from each impact. In this way, nature "balances the books" by keeping the ring supplied with new dust while older dust spirals away or bangs back into the moon. The results of impacts onto small bodies were dramatically demonstrated on July 4, 2005 when the Deep Impact probe slammed into the nucleus of comet Temple 1. A huge cloud of dust was blasted off the comet's surface. Showalter and Lissauer have measured numerous changes to the orbits of Uranus' inner moons since 1994, when their motions were derived from earlier Hubble and Voyager observations. "This appears to be a random or chaotic process, where there is a continual exchange of energy and angular momentum between the moons," says Lissauer. "The changes in the last ten years are small, but the thing about chaos is that small changes build up exponentially with time. As a result, this suggests that the entire system is orbitally unstable." Lissauer's calculations predict that that moons would begin to collide within a few million years, which is extraordinarily short compared to the 4.5 billion year age of the Uranian system. Perhaps the most unstable moon of all is tiny Cupid, whose orbit brings it within 500 miles of the moon Belinda. Showalter and Lissauer propose that their discovery of a second ring, which orbits closer to the planet, provides further evidence for collisional evolution of the system. This ring orbits in the midst of the moons but has no visible body to re-supply it with dust. "This ring may be the telltale sign of an unseen belt of bodies a few feet to a few miles in size," said Showalter. He proposes that the collisional disruption of a moon in Uranus' past could have produced the debris ring they now observe. Hubble's exquisite sharpness and sensitivity uncovered the rings in a series of 80 four-minute-long exposures of Uranus take in August 2004. The team later recognized the faint new rings in 24 similar images taken a year earlier. Recent images from September 2005 reveal them more clearly than ever. Showalter also found the rings in archival images taken during Voyager 2's flyby of Uranus in 1986. Uranus' first nine rings were discovered in 1977 during stellar occultation observations of the planet's atmosphere. During the Voyager encounters, two other inner rings and ten moons were discovered. However, no one noticed the new outer rings because they are extremely faint and much farther from the planet than anyone had expected. Showalter was able to find them by a careful analysis of nearly 100 Voyager images. Because the new rings are nearly transparent, they will be easier to see when they are tilted more edge-on. 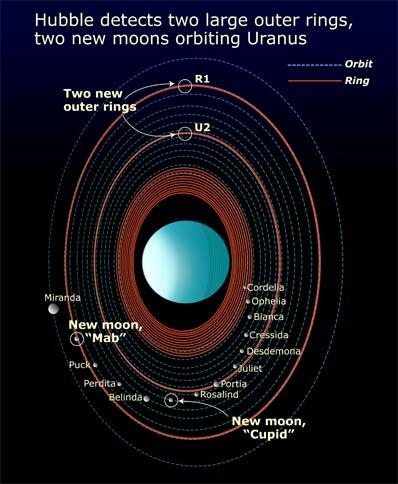 This means that the new rings will increase in brightness every year as Uranus approaches its equinox, when the Sun will shine directly over Uranus' equator. When that happens, in 2007, all of the rings will be tilted edge-on to Earth and the new rings will be much easier to study.